Although the masses and most of the financial media blame hedge funds for their exorbitant fee structure and disappointing performance, these investors have proved to have great stock picking abilities over the years (that’s why their assets under management continue to swell). We believe hedge fund sentiment should serve as a crucial tool of an individual investor’s stock selection process, as it may offer great insights of how the brightest minds of the finance industry feel about specific stocks. After all, these people have access to smartest analysts and expensive data/information sources that individual investors can’t match. So should one consider investing in D.R. Horton, Inc. (NYSE:DHI)? The smart money sentiment can provide an answer to this question. New York-based Long Pond Capital manages a 13F portfolio valued at $3.53 billion as of December 31, with more than 15% invested in a long position in D. R. Horton Inc (NYSE:DHI), more than twice as much as any other stock. The advisory firm also had a $105 million call position on the stock. 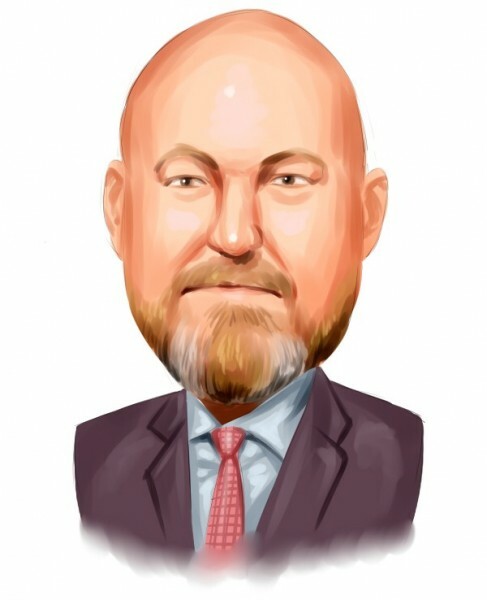 At the recently held Sohn Conference in New York City, attended by Insider Monkey’s founder Ian Dogan, Long Pond’s John Khoury pitched the stock and his bullish views made their way into our exclusive coverage of the conference. “Khoury detailed some of the reasons why his fund is so bullish on D. R. Horton Inc (NYSE:DHI), beginning with the company’s transition into more of a pure-play home manufacturer focused on the entry-level homes market, which he says is the healthiest segment of the market. Existing-home inventory hit a record low heading into 2018, which has pushed home prices beyond the reach of many Millenials, millions of whom are in the market for a home. That should ensure strong demand for precisely what D. R. Horton Inc (NYSE:DHI) is built to offer now. Furthermore, Khoury and his team like the fact that D. R. Horton’s prime geographical regions are all experiencing net migration and have job growth rates exceeding the national average. Khoury categorizes traditional homebuilders as operating in two distinct categories, land acquisition and development, and home manufacturing. Khoury praised D. R. Horton for focusing its model away from the capital-intensive former and into the free-cash-flow generating latter, which leads to far less risk and a higher return on equity. Khoury cites NVR, Inc. (NYSE:NVR) as a prime example of the effectiveness of this model in action, noting that in the lead up to the financial crisis, it outperformed traditional homebuilders by over 300% and continued to generate positive earnings through 2008 and 2009. Nor is Khoury fazed by concerns over the effect that rising interest rates might have on the low-end of the market (or on homebuilders in general), dismissing the prevailing narrative that says they shouldn’t be invested in for that reason. Khoury believes rising interest rates are already priced into the stock and that homes are still affordable, as median mortgage payments as a percentage of median post-tax income stands at just 25%. That figure will rise to less than 30% should interest rates rise by another 100 basis points, which would still be well below the 40% figures in 2006/2007 that preceded the housing market crash. Readers will be interested to know that one of the company’s directors, Barbara K. Allen, purchased 1,000 shares of the company at $25.62 apiece, way back in 2014, pushing her total holdings to 5,650 shares. This was the last instance of insider purchase of the stock and was a lucrative bargain. The homebuilder’s shares have increased to $36.30, as of market close on Nov. 27, a 29.42% increase over the $25.62 purchase price. At the moment there are a lot of indicators stock traders can use to appraise their stock investments. Some of the less utilized indicators are hedge fund and insider trading signals. We have shown that, historically, those who follow the top picks of the best fund managers can beat the market by a very impressive margin (see the details here). We’re going to take a look at the key hedge fund action encompassing D.R. Horton, Inc. (NYSE:DHI). At Q3’s end, a total of 49 of the hedge funds tracked by Insider Monkey were bullish on this stock, a change of 36% from the second quarter of 2018. 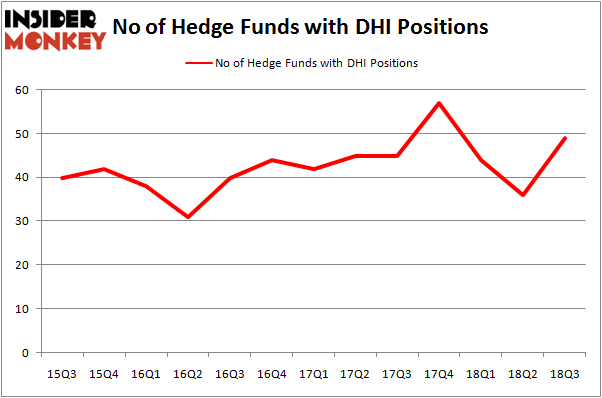 The graph below displays the number of hedge funds with bullish position in DHI over the last 13 quarters. So, let’s examine which hedge funds were among the top holders of the stock and which hedge funds were making big moves. More specifically, Long Pond Capital was the largest shareholder of D.R. Horton, Inc. (NYSE:DHI), with a stake worth $561.1 million reported as of the end of September. Trailing Long Pond Capital was Greenhaven Associates, which amassed a stake valued at $368.2 million. AQR Capital Management, Senator Investment Group, and Millennium Management were also very fond of the stock, giving the stock large weights in their portfolios. With a general bullishness amongst the heavyweights, specific money managers were leading the bulls’ herd. Millennium Management, managed by Israel Englander, initiated the largest position in D.R. Horton, Inc. (NYSE:DHI). Millennium Management had $114.8 million invested in the company at the end of the quarter. Ken Heebner’s Capital Growth Management also initiated a $40.5 million position during the quarter. The other funds with new positions in the stock are Glenn Greenberg’s Brave Warrior Capital, Clint Carlson’s Carlson Capital, and Dmitry Balyasny’s Balyasny Asset Management. Let’s check out hedge fund activity in other stocks similar to D.R. Horton, Inc. (NYSE:DHI). We will take a look at American Water Works Co., Inc. (NYSE:AWK), KLA-Tencor Corporation (NASDAQ:KLAC), Loews Corporation (NYSE:L), and Tiffany & Co. (NYSE:TIF). This group of stocks’ market values resemble DHI’s market value. As you can see these stocks had an average of 28.5 hedge funds with bullish positions and the average amount invested in these stocks was $883 million. That figure was $2085 million in DHI’s case. Tiffany & Co. (NYSE:TIF) is the most popular stock in this table. On the other hand American Water Works Co., Inc. (NYSE:AWK) is the least popular one with only 20 bullish hedge fund positions. Compared to these stocks D.R. Horton, Inc. (NYSE:DHI) is more popular among hedge funds. Considering that hedge funds are fond of this stock in relation to its market cap peers, it may be a good idea to analyze it in detail and potentially include it in your portfolio.